We have to have food to survive, but as everyone learned in school, the body can last longer without food than water. In fact, some studies show that some people can go up to 70 days without food. This is because our bodies are designed to withstand stress. The defense mechanisms triggered when you don't eat can help you to survive as long as you stay hydrated. There is a lot of talk about diets based on ketosis and starvation mode diets. Starvation mode is what your body can go into if you don't eat. While your body can adjust to a lack of nutrition it can only survive for a few weeks if you are also taking in enough fluids. There are a lot of factors that can determine whether or not you can survive a fast of longer than 2 weeks, including genes, health, level of hydration and other factors. Regardless of how long you can go, here is what happens to everybody during 3 weeks of not eating. Within 6 hours of not eating your body is using the glycogen it created by digesting food that enters the bloodstream as glucose. This is the primary fuel of the body. Once the 6 hours is up, the body will turn to consuming excess fat and transforming it into glucose for distribution to cells and tissues via the bloodstream too. Once you have gone 3 days without food you enter into what is known as the "starvation mode." This is a process that the body uses to survive lack of nutrition. Fat stores are gone and the brain needs glucose to function. It begins to use the stores in the liver through a process called ketosis. The ketone bodies replace glucose as fuel for the brain. The body metabolism lowers significantly so what stores of fuel are left is directed towards the brain. After 3 days the liver has no more stores of fuel for the body and brain to convert and consume. This is when the process of autophagy begins to occur. This refers to the process of the body breaking down its proteins in order to create fuel for all its systems. That protein comes from the destruction of muscle tissue, which is one of the tissues highest in protein in the body. This is not a consistent process but peaks after 72 hours before the metabolism slows again to act to conserve protein. After 3 weeks the body continues to look for protein sources to convert into fuel. Once the muscles are gone the only source left are tissues, with the highest concentration occurring in the organs. Before this usually happens, the lack of essential vitamins and minerals usually cause complications as your immune system becomes compromise. If you do not become ill, you will fall into a vegetative state followed by death. People in the final stages of starvation can usually be identified from their lack of muscle mass, lack of energy and bloated stomach. What happens when you don't eat? 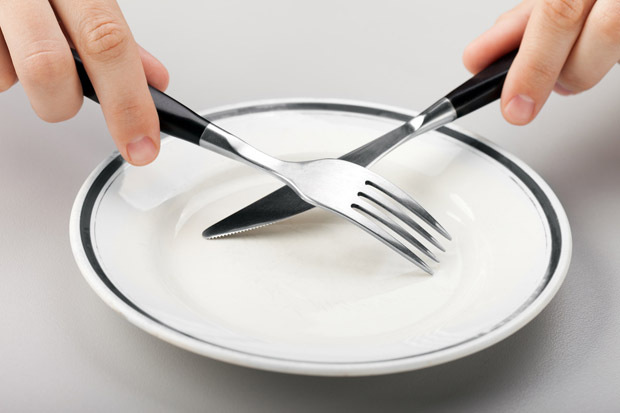 Here're some experiences of people who have gone through fasting for different period of time. Each of them have their own approach, but they also had a similar experience with body adjustment too. "When I tried to fast I didn't make it past the first 48 hours, but I learned something important. The first thing is that you have to make sure you are drinking enough fluids and that you are prepared. I had only skipped one meal before I started and that didn't let me ease into it. The hunger pains went away in the first day, but on the second I was tired and listless. When I had to then do some physical work I couldn't avoid, I then got a pounding headache and felt sick to my stomach. I know I wasn't drinking enough fluids, but I also know I shouldn't have tried to do this unless I could avoid all physical activity. Once I ate again all the nausea and headache went away." "I decided to not eat for a week for a lot of reasons. I wanted to do cleanse of my body and I wanted my appreciation of food to return. To get ready for the 7 day fast I began to slowly replace my regularly food with easier to digest foods. I went from steamed vegetables to vegetable purees to broth for example. Once I was on the broths I started the fast. I took one laxative to start the cleansing process. For a week I drank 5 liters of water a day plus a big orange juice in the morning and I had a spoonful of honey in the evening. When the week was over, I started to take broth and then slowly, over the course of a few days, brought myself back up to solid food by reversing how I brought myself down to the fast. I expected the hunger and weakness that I experienced the first 3 days. What caught me off guard was that the hunger resolved itself by the morning of the 3rd and that by the 4th I began to feel energetic and very good. I was glad the first few days were over the weekend as I was too tired to do anything. Once my body adjusted to the fast I felt like I could keep going for at least another week. The adjustment back to eating normally went well, the only odd bit being that I didn't get my normal bowel movements back until about a month later." "In my experience, fasting comes down to mental fitness. I have done it on just water and did another one where I was allowed one meal a day. I got very hungry on each, but learned that as long as I was having enough fluids that the real problem was just in my head. Keeping your mind focused on the goal while taking care of your body is essential. The first few days are always the same; you are mad hungry, tired and listless. Then it starts to change. By about the 3rd day your body adjusts to the stress of fasting and hunger pains stop while energy returns. Don't go run a marathon or overly task yourself, but you will be fine. By day 7 you are fully adjusted and into it. Mind drinks that can push up the stomach acid levels, like coffee, sodas and some mineral waters. Make sure you plan breaks and naps to prevent a total energy drain. Don't plan to do any major physical activities either. Your body may have adjusted to the fast but you don't have a lot of extra energy to spend. The other thing you should be aware of is you will get horrendous breath. That must be from not having anything in your stomach to absorb odors, I am not sure, but take care of that and no one will notice." It is important that you understand what happens when you don't eat and the seriousness of not eating as many people use not eating as a way to lose weight. If you choose to starve yourself, even temporarily, it can create irreversible effects on the body that can lead to death. When no food is coming in, the body consumes what it already has inside. That begins with fat and then moves onto muscle and other tissue. It slows your metabolism down to conserve energy too, so you won't lose much weight at all. When you start eating again, the body will keep the metabolism low and pack on weight because it is trying to build a reserve. Starvation can alter body composition and processes that can jeopardize organ function and overall health. The effects created by it are irreversible and it is never recommended as a way to lose weight.